HVAC products and accessories. Use our online directory and index to find it faster. Direct-linked results. There is a BIG difference between a furnace and air conditioning programmable thermostat and a heat pump programmable thermostat. Ultraviolet (UV) technology used for killing bacteria and viruses, has been around for some time and is used by many industries. You can now use this same science to get rid of the bad microorganisms that travel in your indoor air. digital thermostat:A thermostat that provides a digital temperature reading instead of a manual dial or lever. Not to be confused with a programmable thermostat. flexible ducting:Also called duct hose or flex duct, this expandable, metal wire coiled, neoprene ducting can come insulated and in different diameters. The advantage of insulated flexible duct is that it can used in unconditioned areas like attics and dry crawl spaces. The disadvantage of flexible ducting is that it can be improperly installed too easily. Look at the manufacturer's instructions on how to properly connect, secure and suspend flexible ducting. plenum:The first main duct connected directly to the HVAC unit's supply air outlet and return air intake. The supply plenum, if attached to a furnace, may contain the air conditioning or heat pump's indoor refrigerant coil. The return plenum connects directly to the HVAC unit's air intake. electronic air cleaner (EAC):A separate or attached filtration unit that uses electrically charged cells to attract airborne particles and other contaminants. The cells and prefilters can be removed, cleaned and reused for many years. These highly effective filtration devices are commonly used in residential applications. electrostatic air filter:A washable air filter that becomes statically charged as air passes through it. The positively charged woven material attracts and traps particles as they pass through the filter. ISCEON m099 (r-438a) refrigerant:A DuPont patented refrigerant designed for the replacement of HCFC-22 (R-22) refrigerant. Can be used as a drop-in refrigerant only when "topping off" a system. The R-22 refrigerant must be completely removed on systems that are critically low. Critical levels are determined when a system's superheat is too high and unable to produce proper heating or cooling because refrigerant levels are too low. Tech Note: Do not add MO99 to a system with a leak without evacuating the system of R-22 refrigerant and repairing the leak. See DuPont's retrofits guidelines for using MO99 (R-438A) . vacuum pump:Device used on refrigerant lines to draw the system into a deep vacuum. Measured in inches of mercury (Hg), a vacuum pump is used to pull moisture and non-condensables from the system before it can be properly charged with refrigerant. A two-stage pump should be used on HVAC systems combined with a micron gauge so a proper vacuum (500 microns or less) can be achieved. A system that holds a vacuum at 28"Hg and below 1000 microns for 10-15 minutes is leak-free and can be charged with refrigerant. If it rises above 2000 microns, there may too much moisture or a leak in the system. programmable thermostat:A thermostat that can be preset to cycle on or off at certain temperatures, times and days of the week. Tech Note: Make sure you obtain the proper programmable thermostat for the type of system or combination of systems you have. There is a difference between single, double (multi) staged and heat pump thermostat. ultraviolet (uv) bulbs:Bulbs (lamps) used in an ultraviolet air treatment system for reducing airborne fungi, mold spores and certain germs and bacteria as it passes from the HVAC unit into the ducting. Commonly installed the supply plenum, these bulbs lose 15-20% of their effectiveness every year with average use and should be replaced every two years. If the fan is ran continuously for air quality purposes, the bulbs should be replaced every year. c.f.m. (cubic feet per minute):A term used for measuring the velocity of 1 cubic foot (12" cubed) of air as it flows out of a fixed space in 1 minute. In HVAC, this term is commonly used to determine the amount of air produced by the fan (blower). Variable speed fans raise and lower its CFMs to regulate the conditioning of the air that is distributed and is more efficient then a single speed fan. squirrel cage blower:An HVAC term used for the round blower wheel that is attached to the motor's shaft. It looks like a wheel that a squirrel could run in and propel. If the system's air filters are not properly maintained, the wheel's slats can become clogged with debris and cause motor, air velocity and conditioning problems. term can also be used for the entire blower assembly including, wheel, motor and housing. learning thermostat:A "learning" or "self-learning" thermostat is an electronic temperature control that is programmed by its manufacturer to detect movement and to adjust its temperature on the frequency and times of those movements. It also analyzes how much you adjust the thermostat at certain times and your local weather changes. This "teaches" the thermostat to optimize temperatures at certain times of the day and night. Ultraviolet air cleaners reduce mold build up on indoor refrigerant coils. This directory contains an index that will guide you to a specific HVAC product or accessory online. 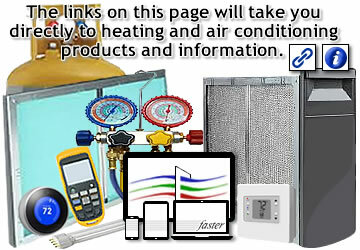 This web page focuses on heating, air conditioning, ventilation products and accessories. This site was developed for the technician, business owner, engineer, and homeowner to assist in finding or researching HVAC items or topics. This page, and its indexes, are ever-changing to meet the demands of our visitors. If this HVAC products directory does not provide the information you are looking for, please contact us.